Services Hard Drive Data Recovery SSD vs. HDD: What’s the Difference? Choosing the right storage media for a specific application has never exactly been a walk in the park. Manufacturers are known for releasing new models at blinding speeds, and the confusing differences can make it difficult to determine which devices will perform best under each set of circumstances. Should something go wrong down the line, however, your early choices could make a huge difference in your hard drive recovery service options. Perhaps most confusingly of all, modern users can select from completely different storage media types. 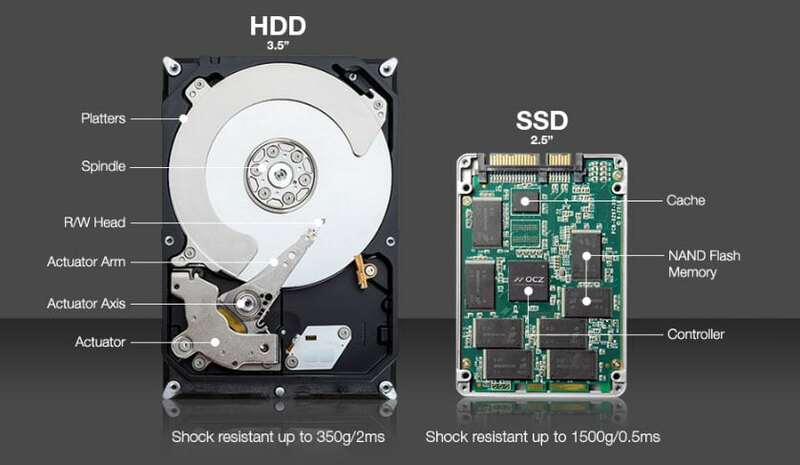 The most prevalent are hard disk drives, or HDDs, and solid state drives, or SSDs. Here are some of the key characteristics that set the two apart. Both SSDs and HDDs record data in the form of bits, or 1s and 0s. The primary difference lies in how each type of device represents these values. Here’s how hard drive works: HDDs employ magnetic fields that point either of two ways to represent a value. An electromagnetic coil called a read-write head induces the appropriate magnetic fields on the surface of metal discs, or platters. The platter surfaces are comprised of thin films that can be magnetized section by section to represent large stores of data. The read-write head moves back and forth as the platter spins to access different memory locations. In read mode, it simply samples the stored magnetic field at each appropriate point. SSDs, on the other hand, store data in groups of flash memory cells built from complex transistor circuits. By applying predetermined voltages to the individual memory cells, a controller can cause them to acquire or release a charge that represents binary values. These stored values are later read by the controller as per user demand. HDDs can’t function without moving parts, which makes them somewhat less durable than immobile SSD Data Recovery is Possible. As you might expect, they’re far noisier, although modern manufacturing processes have largely dimmed the sound they emit to a slight background hum. This also has the interesting advantage of making certain hardware-based HDD faults easy to diagnose or notice by listening. SSDs can be designed with much smaller physical footprints and power requirements, which is why they’re so common in embedded systems and laptops. Most also feature lower data access speeds. HDD technology has a few decades’ worth of a head start over SSD science, so solid state devices currently cost more per byte. They’re also projected to remain less widely available for the short-term future. Your choice depends on what you’re actually doing with your data. For instance, a company whose IT staff spends lots of time gathering business intelligence data from a vibration-filled factory floor might distribute SSD-equipped laptops to limit mechanical errors. A firm that provides data hosting for numerous business clients could build its servers with HDDs to keep costs down. Media creators, programming consultants and other professionals may require a combination of fast performance and affordable capacity. Many use hybrid systems that include SSDs as buffers and rely on HDDs for the bulk of their long-term storage. The fundamental disparities in how these technologies function mean that HDD and SSD devices can experience completely different kinds of failure like hard drive pbc failure . Effective data recovery practices depend on device type, manufacturer and a host of other factors. It’s critical that your data restoration partner understands these nuances and the established best practices used to extract information from each type of device. Read more about HDDs and SSDs in our other blogs, or reach to the TTR staff with your secure data recovery questions.